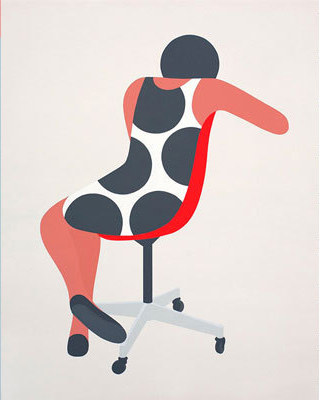 I'm ashamed to admit that I only recently became aware of Geoff McFetridge's work. Geoff is a Los Angeles based designer (NOT an illustrator, see below) with a distinct aesthetic, clever ideas and, in my opinion, a unique and refreshing vision and approach to art, design and the creative process in general. Upon researching him and his work, I came across a talk he gave in 2013 at Walker Art Center's Insights Design Lecture Series. You can find out about Geoff's (impressive and extensive) bio in the links provided, but I wanted to focus on a few key points he makes in this talk, that I felt could be incorporated into my own work as a designer and illustrator, and, more importantly, have opened me up to new ideas and ways of thinking about the design process. Here comes the list. When talking about his work, Geoff is often confronted with the need to define himself - "are you an artist? a graphic designer? how do you operate?" - whereas it's not really an issue in his day to day routine. Geoff sees the separation that exists in "the world" between being an "artist" and a "designer" (in his case a graphic designer). To him it's all just one thing, and it's rooted in drawing and (a term he uses a lot) idea-making, it just goes out into the world in different forms and mediums. Since starting out after graduating CalArts, and faced by confusing visual works by some of his peers, Geoff has asked himself (and i'm paraphrasing) - "How can I make every one of my actions evident and allow for a fast read of my main idea?". Through this notion, he has found his way to the funny and insightful work we now know and love. Essentially, Since starting to find his own voice, Geoff has been Using a design process (sketching, drawing, coming up with graphics) to refine imagery to the point that it looked Found. Interesting to notice how since early in his career, he views his commercial projects vs. personal work. while he treats commercial projects as a framework of structure - a source of income and a way to get his work out in the world - he also realises that ALL the good work is generated in his personal art work, that also develops his work in ways that can be then be reintegrated into his client work ("When i'm in the studio, I always want to be making decisions and every moment to be very direct - the opposite of waste..."). Another super great insight is Geoff's desire to "manipulate" the viewer to "complete an idea in his mind" ("i'm kinda doing a project inside there...") - so, ideally, the work becomes an exercise in creativity for the viewer. In the same realm is putting the viewer in the mind of the creator, using a clear idea and letting the process be evident in the final piece. Geoff draws in a very specific way. He purposefully does not sketch, and his method is more about Moving Forward (similar in a way to contour-drawing). If the drawing is not right, he just does it again - and the repetitive process becomes almost MEDITATIVE - moving deeper into an idea. In terms of style, at least for a while, he was going for a pretty basic look, so that the viewer would feel like he could have drawn it himself. He later gravitated towards a more involved look, that's rooted in the way HE HIMSELF DRAWS (a result of a careful and mindful self-observation of his process). Many of the ideas in his work revolve around what he calls "CLICHÉS YOU'VE NEVER HEARD BEFORE", i,e images that feel like they're referencing a common language, or feel like you've seen them before. There's so much more to be said about Geoff's work, and I find his way of sharing insights into his personality and own unique identity as a creator extermely interesting and inspiring. I encourage you to take a deeper look into his work by following some of the links below, and please watch the entire lecture, it's defenitly worth it. All images are copyright to Geoff McFetridge and/or their respective owners. no copyright infringement intended. a freelance designer and illustrator. I'd love to talk to you about art, design, inspiration and working as a freelance artist!